welcomed me into her challenge, and this November is her plussize edition! 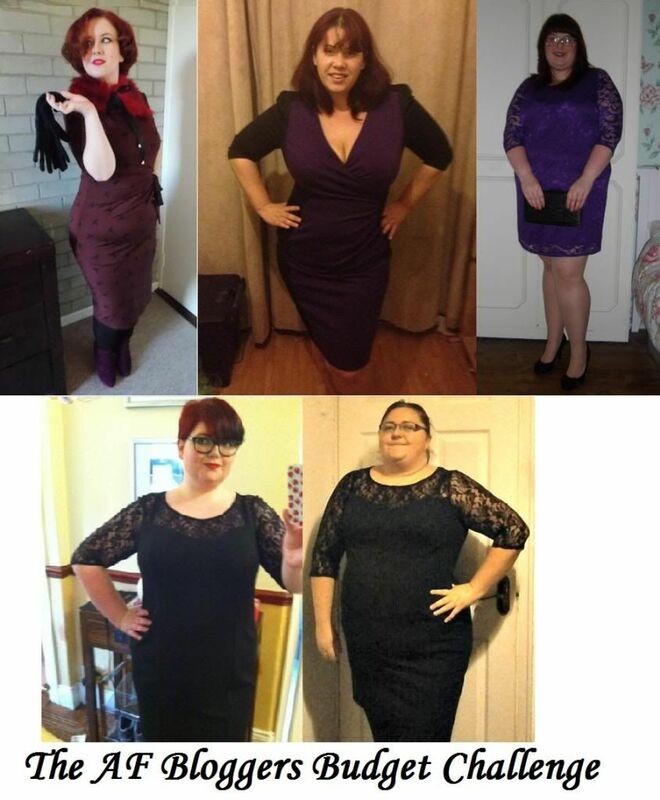 So, for her November edition, we are sampling the delights of https://www.clothingattesco.com/ - and it happened to coincide with the release of their Christmas Party Dresses! Look at us all, looking very glam! About a month ago, I went off, with my budget of £30 burning a hole in my virtual pocket! I thought I'd better start with shoes, otherwise I'd blow the lot on a pretty dress! So pretty! I opted for the size 8, wide fitting shoe, and I'll be honest, it brightens up my day just knowing they are in there, looking at me, getting ready to be worn and set the dance floor alight! I knew I was now down to £20, and limited my search accordingly. I plumped for a size 22, to be on the safe side and here we are! As you can see, it is a great fit across the bust - always a bonus, and the lace detail is perfect! Not too indecent with the higher neckline - but the lace allows for a slightly more revealing look. With my £2 left over, I opted for this belt (which was £4, and I took the gamble to go 'over budget'! I mainly chose this to connect to the sparkly shoes, and because on the model, I felt the dress needed a little extra 'something'. It unfortunately doesn't 'work' with the cut of the dress, and as you can see, it gives me some major 'VBO' (Visible Belly Outline). So, radically, I decided to ditch the belt, and try it as a simple LBD, with the hint of sparkle only in the shoes. I would normally have worn this with my trusty Tesco tights, but as I was recovering from surgery at the time, I couldn't face the idea of tights! Incidently, I also suspect part of the VBO was down to the key hole surgery and the side effects, BUT, I do think this dress, sans belt, does work better. And there you have it! I was in need of a LBD for my wardrobe, and I would certainly recommend trying this dress if you get the chance to. It sits just above my knee (I'm 5'9), and is the ideal dress to see you through the festive season and beyond! Make up wise, I opted for my usual liquid eyeliner 'flick', but added some pencil eyeliner to my bottom lashes to make it a little more dramatic than my day to day make up. I also added my trusty red lipstick to complete the look. So, what do you think? I'm actually really impressed that I managed to get a dress, shoes and a belt for £32. Ah, but Sera, the dress is available in 16 - 28! Love it either with or without the belt. Those shoes are fab. The shoes are totally made for dancing the night away in! I'm rocking my VBO with pride! You look stunning! I almost bought that dress too, it's such a lovely dress. I like the belt so I might have to look into picking one up. Very glam! You can't go wrong with a bit of lace, it works well for any occasion whether it's Xmas, a wedding or a birthday do. Can't wait to style it out for a different occasion! My go to LBD I think!! You look great, and a bit like Emma Stone!